Doesn’t everyone have a state tortoise? My Border Collies start their day running, playing and chasing each other in the back yard. This daily ritual, as I’ve related in an earlier blog post, gives them an opportunity to patrol every inch of the property for evidence of visiting “critters”. Yesterday there were several small holes along the south side of the chain link fence. 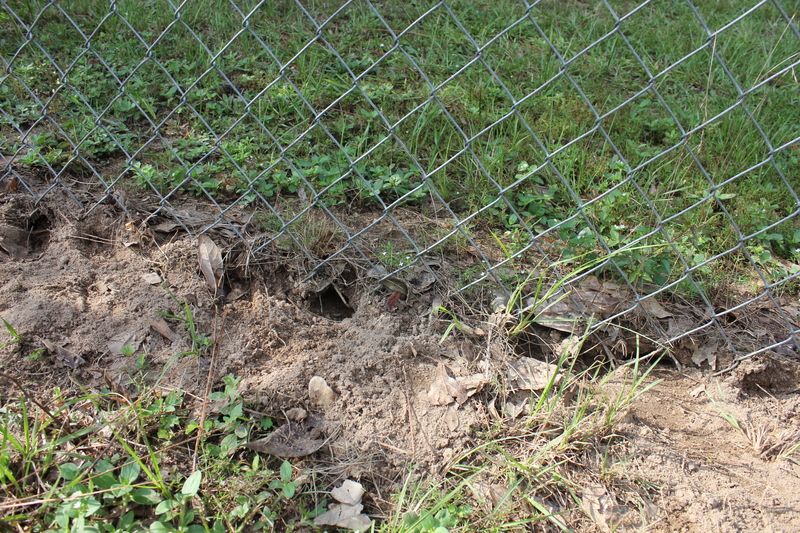 I’m assuming the holes are from a Gopher Tortoise which travels nightly from the north wooded side of the yard. Last year I caught a glimpse of the tortoise after he dug under the fence, ambled slowly to the south side but was still hanging out in the yard after sunrise. I’ve been told they diligently go in one direction and will not be deterred from their destination. This guy is definitely on a mission and seems to be back on the job this summer. It wasn’t until I saw a notice on a County Internet news site that I realized Gopher Tortoise are endangered and are the Florida state tortoise. The latter tidbit was a new one on me. Doesn’t everyone have a state tortoise? I came across evidence of some disturbing activity on the NW corner of the property. Along the fence line there were freshly dug holes in the piles of moldy leaves. 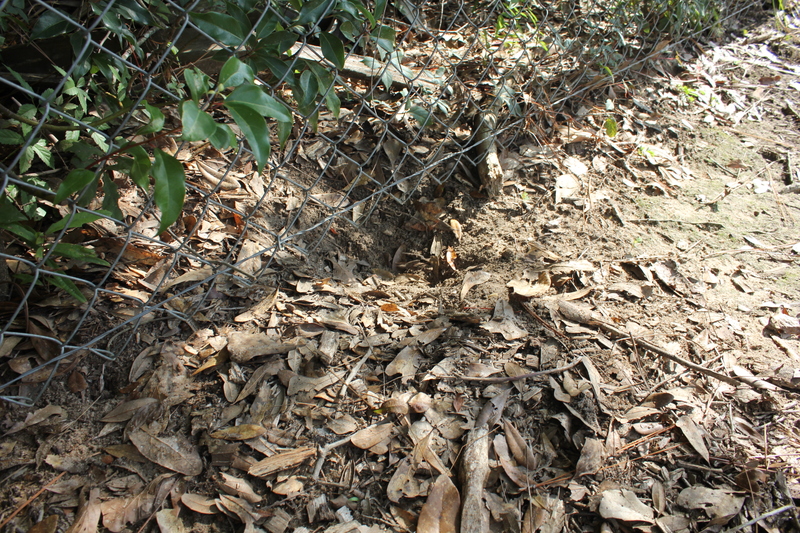 It looked like signs of rutting behavior in the ground, similar to the pictures shown on Animal Planet of the damage done by wild pigs (which I’m told are in the area). The damage was fortunately on a smaller scale than that done by marauding pigs. I called the dogs over to investigate as they weren’t showing any interest in the area, which I thought was odd. They all sniffed the ruts dutifully and moved on. I walked back up to the house and called the dogs to me. Catcher’s coat was damp, his white scruff tinged with dirt. The early morning grass is wet so I didn’t think anything of the brown streaks since Catcher always rolls in the dew covered grass. As I leaned over to give him a pat I smelled the strong aroma of wild animal poop. Oh, lovely, Catcher, I thought sarcastically. What a great way for me to start the day. The creatures that carouse in the back yard don’t do their business in the woods. Oh, no, they leave it all over the field so that the most independent, mischievous dog in my pack of three can start his day in dog nirvana, rolling in “stuff”. Catcher is going to need a quick bath so he can smell acceptable to humans and not like a wild animal himself. That still leaves the question of what animal(s) were in the back forty last night. Was it an Armadillo? Is the Fox back, the one I sadly thought the neighbor had killed after Fox ate his chickens? 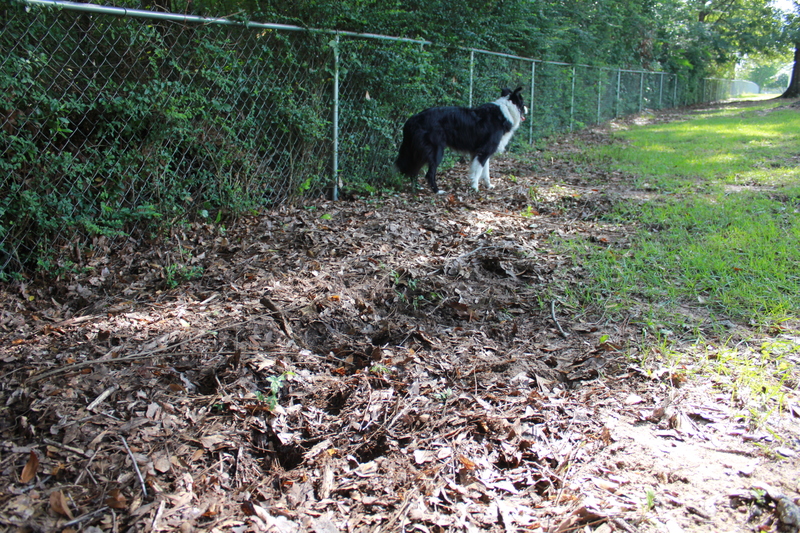 The back yard is often like a crime scene, but changing every day. Perhaps that’s why Catcher is reluctant to leave the back yard each morning. He’s the lead detective or forensic technician and takes his job seriously. Well, I’ll tell you what, crazy dog, your job stinks and so do you. 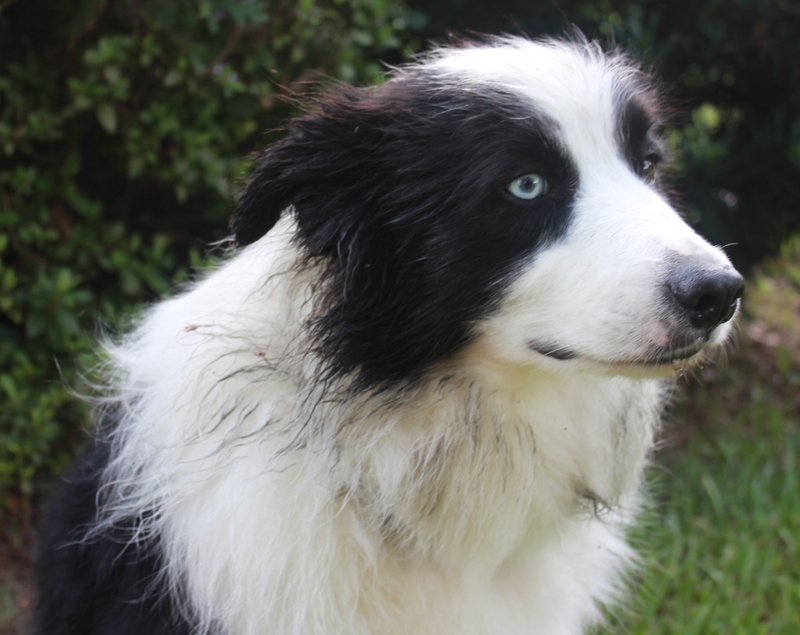 This entry was posted in border collies, Dogs, Florida, florida wildlife and tagged Armadillos, Border Collies, dogs, Florida, Florida wildlife, Gopher Tortoise, retired life. Bookmark the permalink. OMG. I feel your pain. It is horrible and usually happens right before work. ..